A bitter husband and father alienates his wife and son. In 2010, Denzel Washington and Viola Davis picked up Tony awards for their roles in a broadway production of playwright August Wilson's Fences. Clearly enamoured of the play and his role, Washington now directs a screen adaptation. While his experience of the character is of great benefit to his central performance, his respect for Wilson's words is to the detriment of a screen translation that is the very definition of a filmed play. 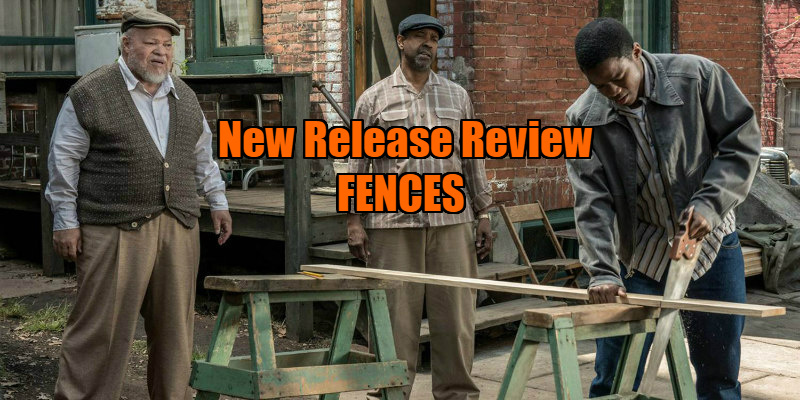 Set mostly in the backyard of a house in a working class African-American Pittsburgh neighbourhood, Fences is the story of one time baseball player turned garbage collector Troy Maxson (Denzel Washington) and his long-suffering wife Rose (Viola Davis) and teenage son Cory (Jovan Adepo). Troy's life is one of mundane routine, working five days a week and drinking seven nights a week. When Cory asks him to sign a document that will allow him to pursue a football scholarship, Troy cruelly refuses. He claims it's for the boy's own good, that he's better off learning a trade or keeping his job stacking shelves in a nearby grocery, but Cory accuses him of simply resenting the possibility that his son might succeed where he failed. This increases tension in a household where everyone who isn't named Troy Maxson already walks on eggshells. Rose finds herself torn between obeying her husband's wishes and wanting the best for her son, the latter doing his best to keep out of his father's way. It would be easy to view Troy as a monster, but while he may be his own worst enemy, he's also a victim of circumstance, having hit his peak as a baseball player at a time when blacks were shunned by the major league. Like many working class parents, he wants security for his children, even if it comes at the cost of their happiness. Like JK Simmons' tyrannical Jazz instructor of Whiplash, he's willing to become a bad guy if it gets the right result for his son. Or at least what he considers the right result. Washington's commanding performance benefits greatly from his knowledge of this text. Monologues ramble on for minutes at a time, sometimes for so long that the original point becomes lost in a scatological barrage. Like the most charismatic tele-evangelists, Troy talks a lot of BS, but his charisma means you can't stop listening. That is, until a point comes where Troy's words begin to ring increasingly hollow, and even faithful Rose is forced to answer back. "What are you talking about baseball for?" she screams in his face as he tries to justify an indiscretion with a rambling sports analogy. Davis will likely take home an Oscar for her performance here, and it's the scene described above that will provide her 'Oscar moment', but it's Rose's quieter periods that show Davis' real strength as an actor. While Washington's performance is theatrical and larger than life, but undeniably great, Davis's is restrained and cinematic, the screen adaptation picking up subtleties lost on a Broadway stage. Rose is all about tender smiles and weary sighs, the latter eventually outweighing the former until she finally explodes with rage. Davis is the best motivation for turning Fences into a movie you could conceive of, but Washington is too in love with the original text to open up the story and give it the visual treatment it deserves. At 139 minutes, it seems every one of Wilson's words has carried over, and while the dialogue is fantastic, there are too many plot beats that play as lazy exposition when translated to the screen so literally. That said, as uncinematic filmed plays go, Fences' words and performances are enough to make it a compelling and powerful watch. 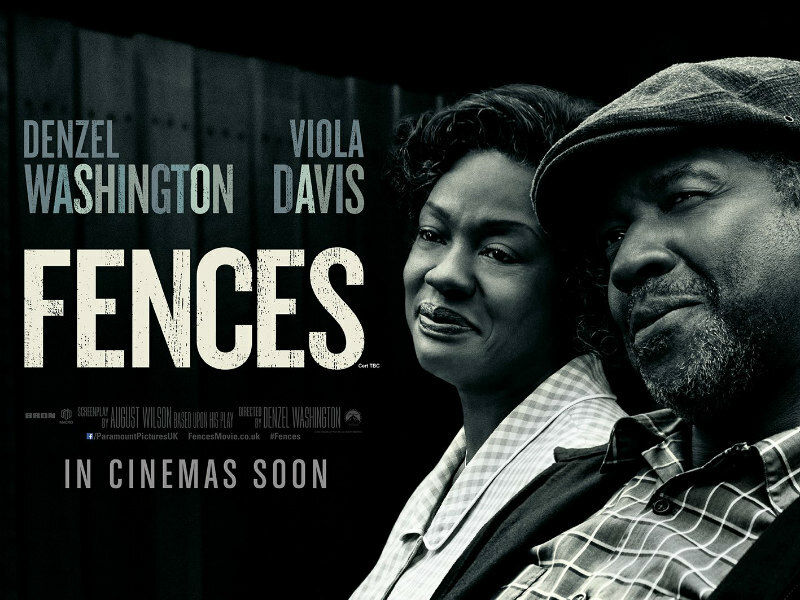 Fences is on limited release in the UK now, and releases wide in UK/ROI cinemas February 17th.